AMDs recent APUs have put AMD back on the map, so we are delighted offer this exceptionally quiet PC based around their fantastic multi-core processors. We are proud to announce our quiet fanned AMD PC housed in the fantastic Nanoxia Deep Silence 1 chassis, which is a perfect choice as it features sound insulation material throughout. At the core of the PC is an AMD processor which offer performance improvements compared to previous generations. The AMD processors incorporate multiple cores and threads, which allow them to excel at multi-core processing events such as gaming, video editing, photo-processing, while simultaneously running other programs. 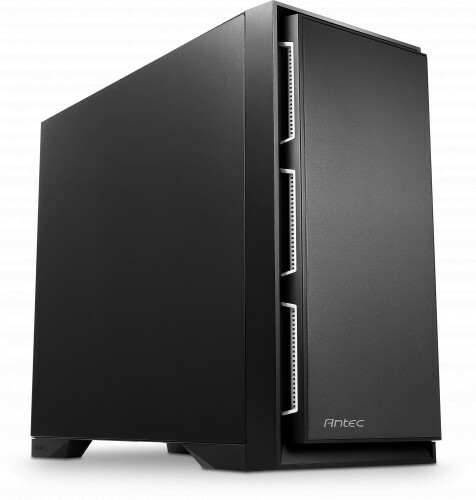 It is the perfect system for customers looking for an inconspicuous PC for general home / office use. Our aim is to provide one of the world's quietest AMD based PCs without compromising performance. We have therefore chosen only the best and quietest components for this PC. The AMD processors are supplied with a CPU cooler, which are reasonable in terms of quietness. But we highly recommend that you opt for one of the coolers in the configurator as they will not only perform better but will also be much quieter. Our recommendation is the Noctua NF-U12S SE-AM4 which is an excellent CPU cooler and being from Noctua it is exceptionally quiet. As for graphics, we have only made available either totally fanless cards or cards that can run semi-passively, meaning the fan will only rotate when the GPU exceeds a certain temperature. This means that only noise will be generated when you are pushing the PC, for example during gaming or while running other graphical programs. Alternatively, you may want to opt for a processors that includes Radeon Vega Graphics. This not only negates the use of a discrete graphics card but it will also reduce the overall cost of the system. See "Graphics Card Options" below for more information. The Ryzen Serenity is configurable with a choice of two motherboard. Both motherboards are from ASUS, the ROG Strix X470-F Gaming and the ROG Strix B350-F Gaming. The main difference between them is the chipset used. The X470 offers more features over the B350. For example the X470 has more USB3.1 (gen1) ports, more SATA ports and also supports Nvidia SLI. The X470 also has two USB3.1 (gen2) ports, one Type-C and one Type-A, whereas the B350 has two Type-A USB3.1 (gen2) ports. The below images show the differences between the I/O ports found at the rear of the PC. Some of the processors available with this system have integrated graphics, but there are some that don't. This can be a little awkward when configuring the system, as to whether a discrete graphics card is needed or not. To try an make things clearer all processors that include built-in graphics have the following, "with Radeon Vega Graphics" in their product name. The number within "Radeon Vega Graphics" indicates how many graphics cores each processor has. For example, the AMD Ryzen 5 2400GE with Radeon Vega 11 Graphics, has a total off 11 graphics cores. The larger the number the greater the performance. ASUS PRIME B450-PLUS AM4 ATX Motherboard ? ASUS ROG STRIX X470-F Gaming AM4 ATX Motherboard ? Noctua NH-L9x65 SE-AM4 CPU Cooler ? Nanoxia Rigid RGB LED, 30cm, ASUS AURA ? It is very important to note that not all AMD CPUs on this configurator have built-in graphics. If you have chosen a CPU with "Requires Graphics" in its product name then you must select one of the graphics cards below. 2GB ASUS Geforce GT 1030 Fanless Graphics Card ? 4GB Palit GeForce GTX 1050 Ti KalmX Fanless Graphics Card ? 4GB ASUS GeForce GTX 1050Ti ROG STRIX GDDR5 Graphics Card ? 6GB Palit GeForce RTX 2060 GamingPro OC Turing Graphics Card ? 8GB Palit GeForce RTX 2070 JetStream Graphics Card ? 8GB ASUS GeForce RTX 2080 DUAL OC GDDR6 VR Ready Graphics Card ? 11GB Palit GeForce RTX 2080 Ti DUAL GDDR6 Graphics Card ? Micronics Classic II AC 500W PSU, 80+ ? Micronics Classic II AC 600W PSU, 80+ ? StarTech USB 150Mbps Mini Wireless N Wi-Fi Network Adapter - 802.11b/g/n ? Gigabyte Dual Band Wireless-AC GC-WB867D-I (Wi-Fi Only) ?